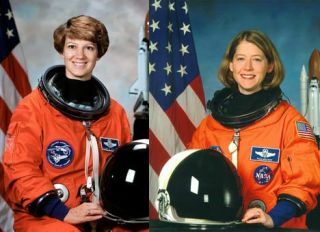 Though dozens of women have flown on the space shuttle during the course of its 30-year career, only two have commanded the spaceship. Those two are NASA astronauts Eileen Collins, who led the STS-93 flight of the shuttle Columbia in July 1999, and Pamela Melroy, who commanded the STS-120 mission of Discovery in November 2007. Because becoming a shuttle commander requires previous spaceflight experience, as well as at least 1,000 hours experience piloting a jet aircraft, fewer women have achieved this position than those that have flown as mission specialists. Collins was born in 1956 in Elmira, N.Y. She has masters degrees in operations research and space systems management, and is a retired colonel in the U.S. Air Force. She was selected as an astronaut candidate in January 1990. Astronaut Eileen M. Collins, STS-114 commander, waves while floating in the Zvezda Service Module of the International Space Station. On her first spaceflight, the STS-63 mission of Discovery in February 1995, Collins became the first female space shuttle pilot, a second-in-command position behind the commander. After another flight, the May 1997 voyage of Atlantis, Collins became the first female space shuttle commander on the STS-93 mission of the shuttle Columbia. On the first flight she commanded, Collins and her crew launched the Chandra X-ray observatory, a space telescope that went on to make many significant astronomical discoveries by observing the cosmos in X-ray light. The observatory is still operating today. Collins followed up that flight by commanding the STS-114 mission of the Discovery in July 2005. That flight was the first shuttle mission after a two-year hiatus following the Columbia shuttle disaster in 2003. During that "Return to Flight" mission, Collins and her crew visited the International Space Station, testing out new safety procedures, including a backflip of the shuttle called the Rendezvous Pitch Maneuver. This move, conducted as the shuttle approaches the station to dock, allows astronauts on the outpost to snap hundreds of detailed images of the orbiter's underbelly to be analyzed for any signs of damage incurred during launch. Collins carried out the maneuver for the first time on that flight. It is now a routine part of every shuttle mission to the space station. "It was brilliant, creative idea," Collins said. "Some smart engineer came up with this idea, and it's really increased the safety of the shuttle. To have the ability to do this maneuver has really increased our confidence in the shuttle heat shield when we return home at the end of the mission." Melroy was born in 1961 and hails from Rochester, N.Y. She has a master's degree in Earth and planetary science, and is also a retired colonel in the U.S. Air Force. Astronaut Pam Melroy, STS-120 commander, floats into the Unity node of the International Space Station while Space Shuttle Discovery is docked with the station. Melroy was selected as an astronaut in December 1994 and flew on her first flight, the October 2000 STS-92 flight of Discovery, as the mission's pilot. She served again as the pilot on the STS-112 flight of Atlantis in October 2002. Melroy recounted an experience during her first flight, while looking down at a nighttime view of China. "I realized that somewhere down there in China, someone had looked something up on the Internet, stepped out their front door with their son or daughter and pointed out that little thing flying in the sky way above and said, 'Look, there's the space shuttle.' And waved. So I waved back," Melroy said. "Here was a place I had never been, and the thing that was connecting us was technology. I had a sense of profound connection with that person there that I would never meet." In October 2007, Melroy became the second female space shuttle commander, when she led the STS-120 mission of Discovery. On this flight, Melroy and her crew delivered the Harmony node to the fledgling International Space Station. It also happened that she rendezvoused with another female commander, NASA astronaut Peggy Whitson, who was commanding the International Space Station at the time. Melroy said this coincidence actually made a deeper impression on her than being the second female shuttle commander. "I think to me it was actually a bigger thing that Peggy Whitson and I were flying at the same time in space and that no one had planned it that way," Melroy said. She said the highlight of her spaceflights was sharing the experience with her fellow astronauts. "The connection you feel to the other people who are sharing this really strange environment with you, it's so different and you can't explain it and they become like your family forever," she said. "Everybody keeps using the word 'bittersweet' and it really is true," Melroy said. "From a pilot's perspective, it's really an extraordinary spacecraft and aircraft. The capability to not just launch enormous payloads, but to bring things back is one I don’t think we are going to see again for a long time." After the last shuttle flies one more time, NASA's three remaining orbiters will be sent for retirement at museums in the hopes of allowing the public to connect with the vehicles by coming face-to-face with them in person. "Every single time I have ever been close to a space shuttle I have just been really awed," Melroy said. "I think by being so close to these amazing vehicles, it's just going to be an absolutely fabulous thing in a way that I don’t think any other space artifact will ever connect with people the way the shuttle will." Overall, Collins said the space shuttle's most lasting legacy will be its achievement in building the International Space Station, as well as launching the Hubble Space Telescope. She also credited the shuttle with "bringing the notion of space exploration closer to people around the world, because astronauts from so many different countries have flown on the shuttle. Because of that, people from different cultures have been inspired to learn about space." Both Collins and Melroy are now retired from NASA's astronaut corps.